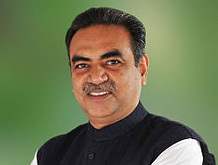 Chandigarh : BJP Chandigarh state president Sanjay Tandon announced that BJP Chandigarh will celebrate party’s foundation day and 125th Birth Anniversary of Baba BheemRaoAmbedkar in the city. More over State Executive meeting will be held on 3rd of April 2016 at Punjab BJP Office Sector 37 Chandigarh. He said on these special occasions party activists will organize various programmes in the city . Giving brief information about the meeting of the State Official bearers, District Presidents and Morcha Presidents party General Secretary ChanderShekhar told that all the members of the party who attended the meeting took the decision unanimously that on the foundation day 6th April 2016, all the party official bearers and activists on booth level will unfurl the party flag on their houses and on 14th April party will organize various programmes in the city on 125th birth anniversary of Baba BheemRaoAmbedkar. He said that state president Tandon also explained the various issues and decisions which took place during the National Executive meeting held at New Delhi for two days. He told that party high command took the big decision that now every state or union territory have to organize the state official meeting within a week after National Executive meeting and within 21 days all the states have to organize State, District and Mandal level executive meeting within these days. After the decision of high command all the members who attended that meeting agreed that on coming 3rd of April State Executive meeting will be arranged on Punjab BJP Office Sector 37, Chandigarh. President Sanjay Tandon told about the policies of the Central Government and appealed all the members to take all the achievements within the Chandigarian and make them understand that party is working for people. Other sectors like Swatch Bharat Abhiyan, Mudra Bank Yojna, JandhanYojnaetc were also discussed in detailed in the meeting.